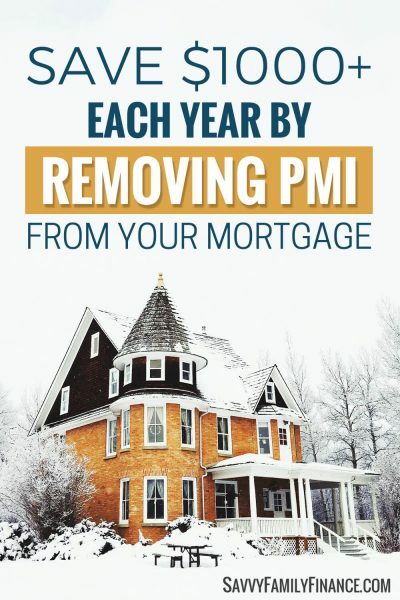 Inside: Find out how getting rid of PMI can save thousands of dollars each year by lowering your mortgage payments. If you are a homeowner, chances are you pay a mortgage. And, if you didn’t have a full 20% or more down payment at hand when buying a house, you are most likely paying for PMI and would like to remove your private mortgage insurance payments. Can you get rid of PMI? You might have seen the term PMI while researching mortgages, or maybe you’ve just noticed it as a line item on your mortgage bills. PMI is the acronym used for private mortgage insurance. It is a mortgage insurance used with conventional loans that protects the lender (bank) and not you, should you fail to make payments on your mortgage. Conventional home loans require private mortgage insurance if you bought a house with less than 20% down payment or if you refinanced your home and have less than 20% equity. There are a few different ways you might pay PMI, but the most common way is to have it included as a monthly premium rolled into your mortgage payment. The rate you pay will vary depending on the amount of your down payment, your credit score, the market, and your lender. Let’s say you find a home you love which costs $350,000. You only have enough saved for a 5% down payment, or $17,500. The terms of the loan are 4.25% for 30 years. This means you will add approximately an additional $200 a month for your PMI insurance. By getting rid of PMI, you could reduce your monthly mortgage payment by $200. That is an extra $2400 a year you could free up for something else! Can you get rid of PMI? If you have a conventional loan on your house, it is possible to eliminate the PMI payment requirement. The basic requirement to drop PMI is to have at least 20% equity in your home. When the mortgage balance is down to 80% of the home’s original appraised value, you can ask the lender to cancel PMI. Should you forget, the lender is required to stop PMI when the loan balance drops to 78%. Related post: 15-Year vs 30-Year Mortgage: Which Is Right for You? You can wait for the lender to automatically remove PMI once the loan is at 78% of the original appraised value of the home. But, what if you want to stop paying PMI sooner than it would take with normal monthly mortgage payments? You can get rid of it early using a few different methods. Keep in mind, some loans require PMI for at least 2 years. Check with your lender for details. Prepay your loan: You can make extra principal payments on your loan to reduce the balance at a faster rate. Even $50-$100 each month can make a big difference. Get a new appraisal: Ask your lender about getting a new appraisal on the property to determine if your equity is now at 20% or greater. You will most likely need to pay for the appraisal. In areas where home values have increased, this can be a good approach. Refinance: If interest rates are good, it may make sense to refinance. During the refinancing process, your home will probably be reappraised. If the home value has increased enough and you have 20% equity, the lender most likely won’t require mortgage insurance. Remodel: You can add to your home’s value by remodeling and then getting the house re-appraised. When we bought our first house, we had only about a 10% down payment saved up, so we had to pay PMI. It was an expense we were able to absorb, but we worked hard toward getting rid of the payment early. We took a two-pronged approach of prepaying our loan as well as getting a new appraisal on the property as values were increasing. If you have decided to request having your PMI canceled early, there are a few requirements that must be met. Once you satisfy the requirements, the lender generally will cancel the PMI early on request. FHA-insured loans with less than 20% down payment have what is called a mortgage insurance premium, or MIP. The mortgage insurance premium is similar to PMI, but, on recent FHA loans it cannot be canceled. Instead, to eliminate MIP you will need to refinance into a conventional loan. If you are interested in getting rid of the mortgage insurance on your loan, research your options. Then contact your lender and ask what steps you need to take to remove your private mortgage insurance. Are you paying PMI? Have you tried to remove your private mortgage insurance? Share your experience! This was very informative and helpful! I didn’t k ow about PMI but I will defienlty be looking into it now! Anything to save my money! !